Actually it doesn’t look like Spring up in Hayward yet, but I swear I can feel it coming. There is a different feel in the air, something I can’t quite describe-maybe it is the fresh scent of a new season coming, or maybe it is the background chattering of the birds arriving from their winter havens, perhaps its as simple as the sun standing proudly, front and center, after such a long period of drabness-I don’t know, but whatever it is, the feeling is intoxicating! Its early morning and the plan is an invigorating snowshoe walk and I can’t wait! Dolly, as usual, ‘assists me’ while I put on my snowshoes, and the sun warmly greets us as we round the corner from the cabin. 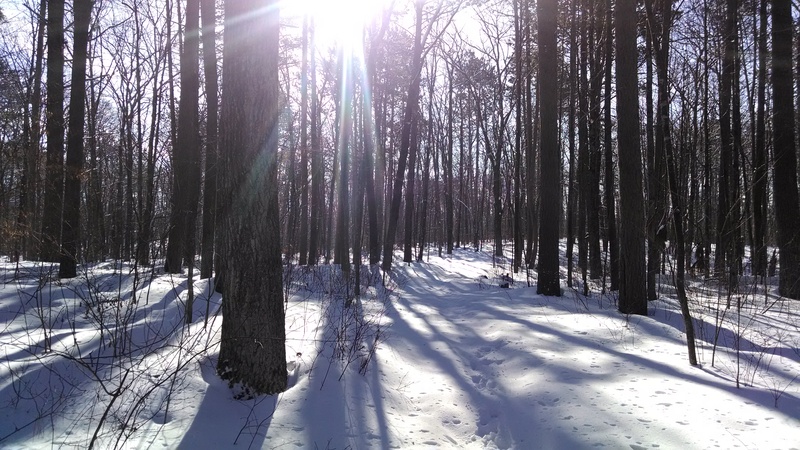 The new depth of snow-cover was no match for me and Dolly this morning – we steamrolled a new path through the fresh 8+ inches as the intense rays of the morning sun guided us through the barren woods. Dolly amused me by grabbing fallen branches from under the snow and rushing recklessly about with them in her mouth, whipping everything (including me!) in her path. LCO was a stunning sight this morning. The combination of the intense blue sky and the golden sunlight was guaranteed to lift anyone’s spirits, even those stuck in the deepest winter void. We stopped for a few quick pictures and then continued along the lakeshore gazing at the lonely, closed-up cabins and cottages. 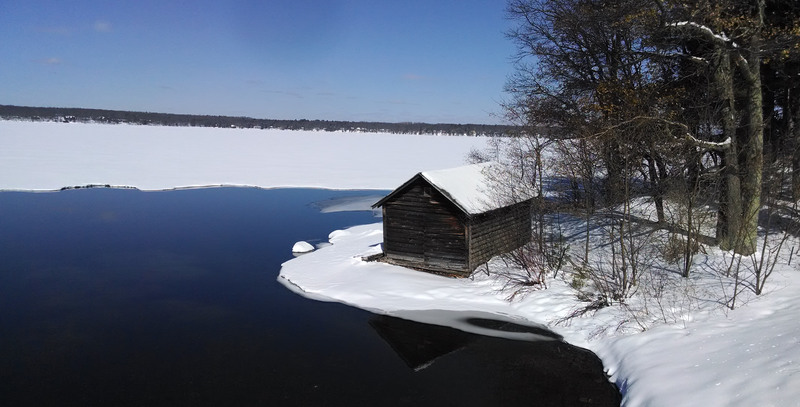 A solitary snowmobiler shot by us on the lake and he seemed so out-of-place to me – it was too much of a Spring-feeling day to have a snowmobiler remind me of the snow…. Dolly and I ended our walk at the dock by our cabin. We have high elevation on the Point, a solid 40+ steps up to the cabin. 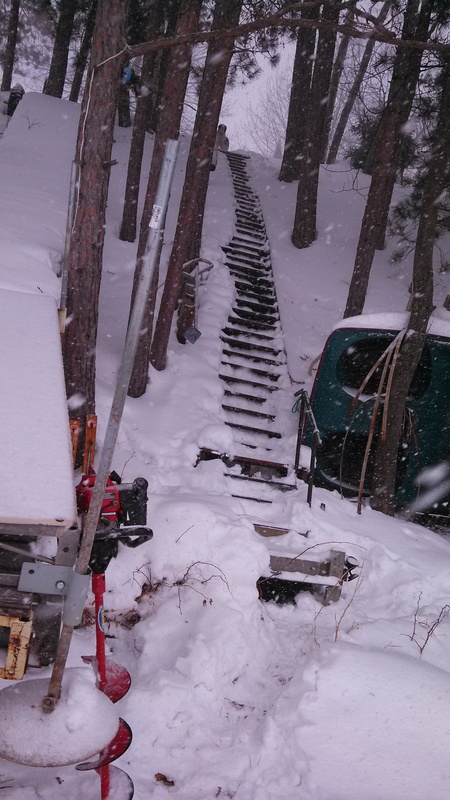 After taking my snowshoes off, Dolly and I began climbing the staircase. The metal-grate steps were snow and ice-covered but fairly easy to climb and we approached the top rather quickly. Almost to the cabin. Suddenly I was laying face-down on the ground and quickly sliding down the hill as if I was on a luge. I was total caught off guard and couldn’t even seem to compose myself enough to figure out how to stop. My foot finally wedged up against a small tree and I crunched up to a stop. For a few seconds I tried to gather my wits and figure out what just happened, I was at least grateful to still have my snowshoes in my grip. I rolled over to my side and looked up the hill, and there, of course, was Dolly in the ‘play’ stance as if I planned this for a chase with her. By now I was too far from the staircase to walk back up like a regular person might do, so I rolled over to my hands and knees and started upwards. During my crawl up the hillside I discovered a sinister layer of ice hiding under the snow cover, the cause of my quick plunge downwards. I was almost to the top and then the ice became unmanageable to even crawl on- I was losing ground again fast so I rolled over and snapped my snowshoes back on. Gingerly, I stood up and tested out my ability to stay upright. So far, so good, the metal crampons on my shoes gripped the thick ice and kept me going, but it sure took a long time to climb that last 10 feet up the hill. I actually skipped the hot chocolate when I got back to the cabin. Today proved to be a real sweat-inducing workout and the last thing I needed was more warmth. The morning walk did leave me famished so a hearty breakfast of eggs and bacon was in order and of course Dolly convinced me that she also deserved some. What a glorious morning walk for us – I will miss the snowshoeing once Spring makes a grand appearance, but we’ll replace it with some other activity, I’m sure of it. 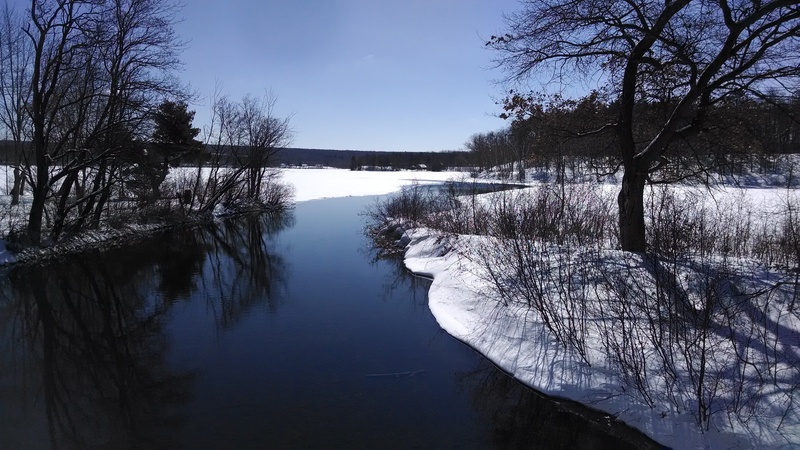 This entry was posted in NORTHWOODS LIFE, Snowshoeing and tagged cabins in hayward wi, cathy lareau realtor, choose hayward wi for vacation home, real estate in hayward, snowshoeing hayward wi, why buy a cabin in hayward wi, winter in hayward wi. Bookmark the permalink.